RAFA Solutions' UI Control Kits being the winner for LabVIEW Tool Network product of the Year Award for 'Developer productivity' have also prepared a technical session for "Designing Advanced User Interface in LabVIEW" and provided the best practices for designing user-friendly and intuitive UIs for applications developed in the LabVIEW environment. The presentation explored several examples showing the main differences between UI designs depending on applications and intended users. For more information please visit this link, here you can watch the session and download presentation. Can Event structure be handled in Sub VI's? If yes then what is its method. I created an XControl for collapsing and expanding controls. It is just an suggestion to discuss. Improvements are welcome. Things I have in my head are speed optimization and plugin-like data for the content of the controls. To solve the first task I basically tracked the coordinates and printed a textbox. Then by monitoring the coordinates for the mouse I know if I clicked the the textbox "object". I assume that there might be more efficient ways to create these object, having properites or nodes that would help in my second task, which is in either case challenging.. 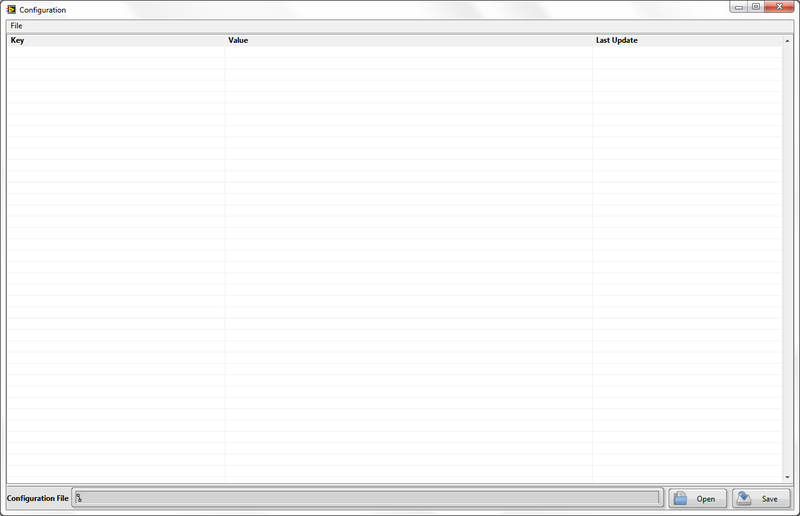 I present them my gallery of snapshots of applications developed in LabVIEW. 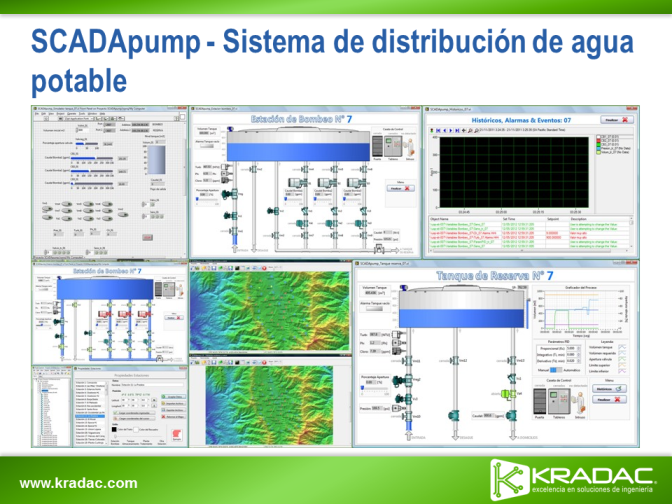 I thank to some members of LabVIEW-user groups, for their contributions with regard to the design of GUIs. After seeing this idea exchange post I decided to investigate a couple of ways of implementing that functionality in LabVIEW today. In this video (and the attached code) I demonstrate two reusable ways of adding an "Explore" option to file paths. The first is creating a new XControl that adds the Explore option but otherwise behaves and looks like the File Path control. The advantage of this technique is that the Explore option is available at edit time. Downsides include having to replace any existing file paths with the XControl and incompatibility with arrays and the like. The second technique uses the concept of a "BRAT VI" (a child that controls the parent). You drop my VI on your diagram and it adds the Explore option at runtime to any path control or indicator on the front panel of that VI. It does this by getting a reference to it's caller, and registering to recieve events for any path control whenever the shortcut menu is activated or a menu item is selected. 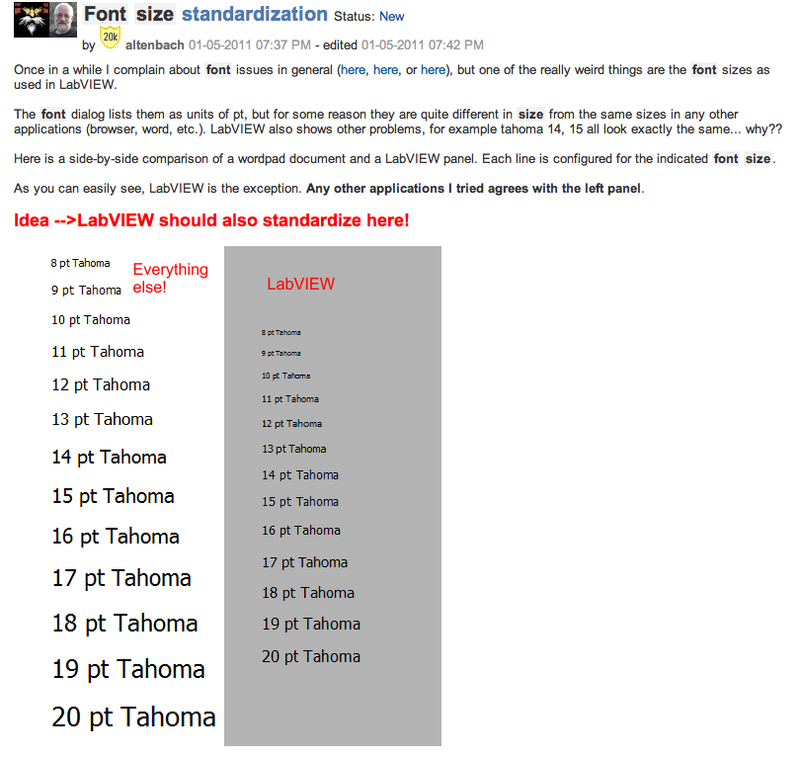 I did some digging and was able to write a VI to convert a point size into the equivalent LabVIEW size. I make .exe, using Properties I hidden menu bar. Menu bar is only hidden when exe is running. But when we stop the exe then again Menu bar is come. Problem: I never want to show menu bar.....when exe is not run means ideal mode. I trying by run timemenu bar and file-> property option. So is it really possible to add any new UI objects to your user interface during run-time and even link data to those new objects? Yeah it is! If you use some nice tricks I made this demo for Northern Europe NIDays last year and I just wanted to share it with our UI Community. The code is pretty simple and I made it for demo purpose only. So it's not ready application with proper error handling etc but you will find some cool functions there that you can reuse with your projects. I tried to keep the code as clean as possible so it should be pretty easy to understand how it works. 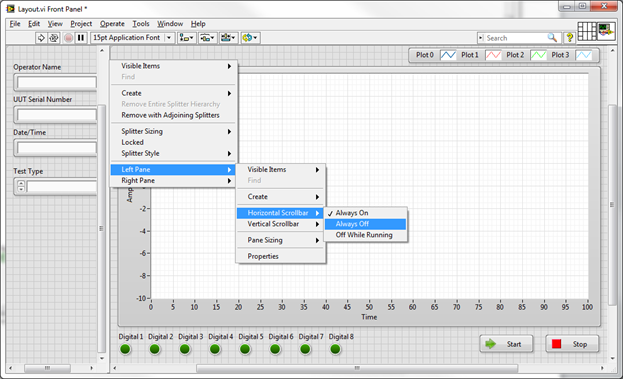 With this demo you can add new LabVIEW UI objects to the Front Panel and move those objects around with your right mouse click (works best with LabVIEW 2011 btw. 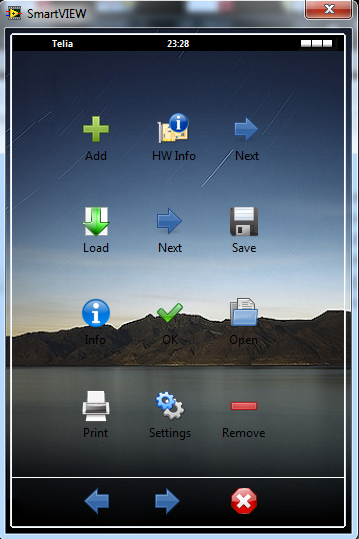 There is some feature in 2012 that will popup the right click menu to the objects even though it is disabled. You can hide the menu by clicking the Esc button during the movement if you use 2012.). you can also link data to these new objects (just watch the video how to do it). If you have any questions please comment and I will try to answer those. Enjoy! Updated: Added also 2011 verision and fixed one linking problem. 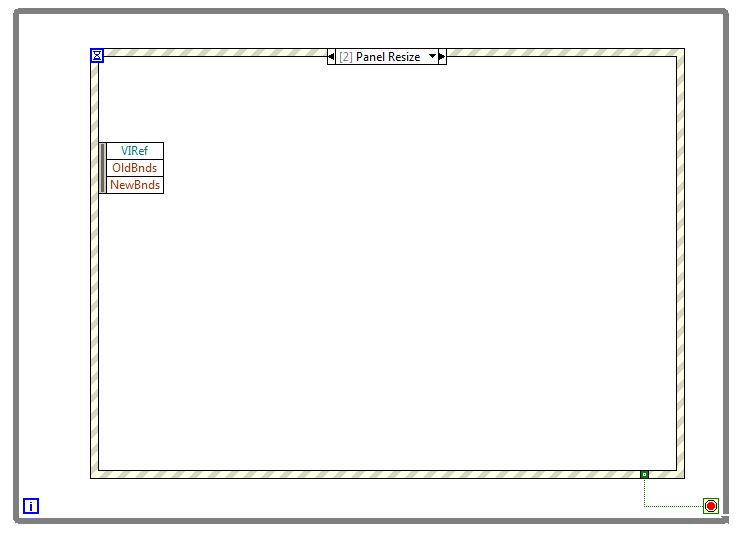 Hi all, this is LabView 2010 version of subVI with a vertical cluster of fallen oil drops. As soon as I work for Oil & Gas industry, this code is an alternative to the code developed by Pelle Steen. After a couple of hours, I'm sort of satisfied. 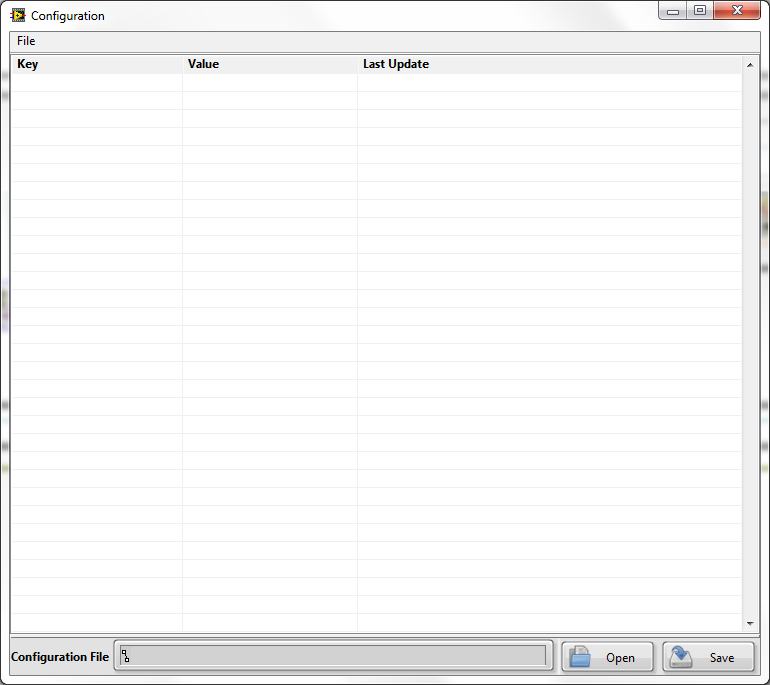 Just run the file called Loader Example.vi in the attached folder. If you want to resize the cluster that contains all the moving objects, that should work just fine. And if you want to add more objects than 5 that should also work fine as long as you tweak the "slow speed area" (see code) setting. I imagine if you spend some more time, you can even make nice patterns in the y-direction. I have finished my tookit, for LabVIEW and I would like to share it with LabVIEW community. I think, the quality UI become as important part of a LV code as a functionality itself nowdays. 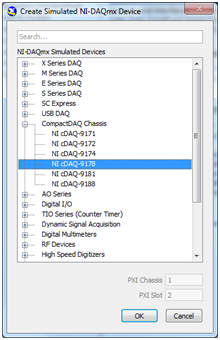 Customizing the LV Controls & Indicators can be done many ways, but what about the LV RTM? (Run Time Menu). Maybe the color of RTM can be chage (I'm not sure) but I clearly know there is no way to insert images into menuitems, that could improve the presence of our FP. So, I've started to develop a control that may replace the "old-timer" LV RTM. Before saying some words about the toolkit please take a look at the attached pictures. 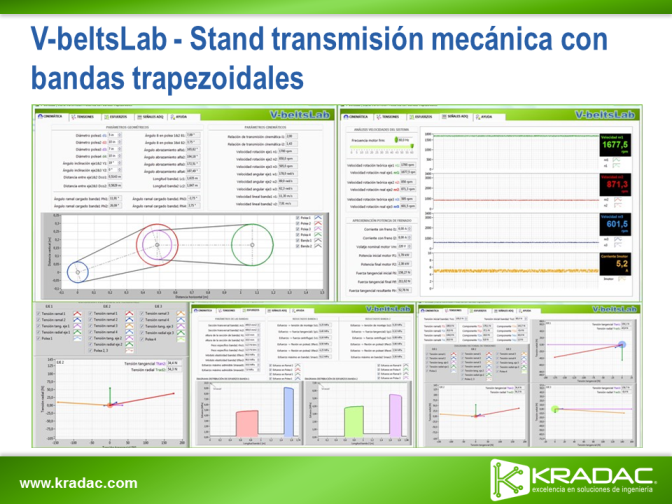 The pictures above show the ToolStrip can be used as Horizontal and Vertical dock. Before use this toolkit, please visit: www.mvtech.eu for more information about usage. Toolkit Download Link - the zipped file contains an exe. It is not neccessary to run the exe but makes your life easier if you dont want to copy the toolkit files into user.lib\ manually. Parent Tag must refer only ToolStripMenuItem.ItemTag or empty string. For more info can be found on the website. The picture above shows the event handling part of the code. The ItemTag <string> is an individual identifier of each ToolStripItem. There are two types of checked-state. If a ToolStripMenuItem has any icon, the checked state dispalys as the "New" menuitem. Under the New menuitem, Open item has the same icon but its state is unchecked. And if the menuitem doesn't have any icon, the standard pipe appears as its state is checked. MenuEvents can be handled by Queue. Please check Example II. The Process Queue is responsible for ToolStrip Event handling. The Queue - Dequeue element returns the ToolStripItem ItemTag. Password protection removed from subVIs. - Feel free to update or modify the source code. Copyright (c) 2012, mvTech <info@mvtech.eu> | All rights reserved. This Full Version tookit is free to use for everyone. Please place the ToolStrip logo to your application about window. Feel free to use and ask if you have any question! 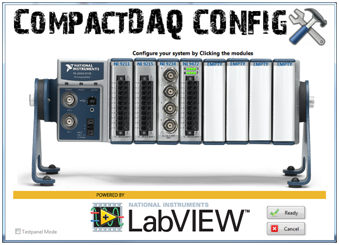 Often as I open new software and the user interface pops up, I make a few typical clicks around, and I can almost immediately recognize it as a LabVIEW application. It’s funny how as a LabVIEW developer, I can recognize just from a user interface alone and some minor interaction that it has been written in LabVIEW. In the past, I found this true with other development platforms; although this is no longer as obvious. 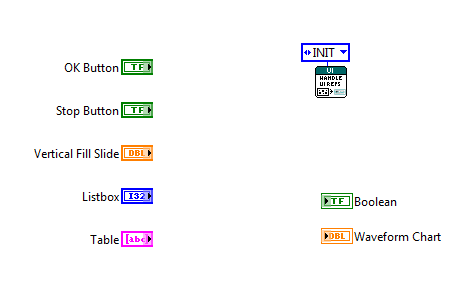 So, what is one of the things that made me suspicious of it being written in LabVIEW besides my familiarity with the common controls/indicators? The screen would not resize. 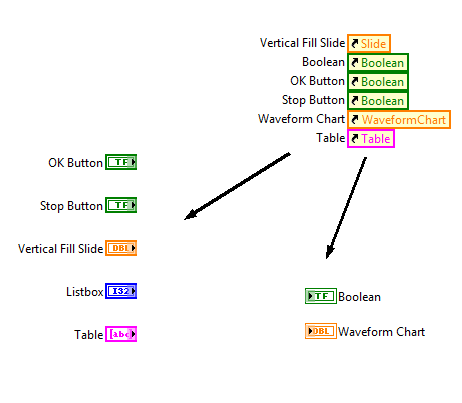 It seems that generally speaking there is an opinion that in LabVIEW it just isn’t easy or worthwhile to design a nicely laid out, resizable UI. There aren’t very many good examples or documentation available, but it is really quite simple to accomplish. Resizable UI’s give a great feel to clients and give your software added professionalism at very little cost to developers. There is one caveat to this though, it should be considered up front at design time. Completing software without this in mind and trying to convert a UI to become resizable is typically a nightmare and should be avoided when possible. This is most especially true with complex UIs. The most important step in making a UI resizable is some up front planning. Typically, we do some mock ups of how we anticipate the user interface to look and feel. This is a good time to plan which aspects you want to resize, and which you do not. Elements you wish to resize or not resize should be grouped into sections. Keep in mind these are just general recommendations, not rules. 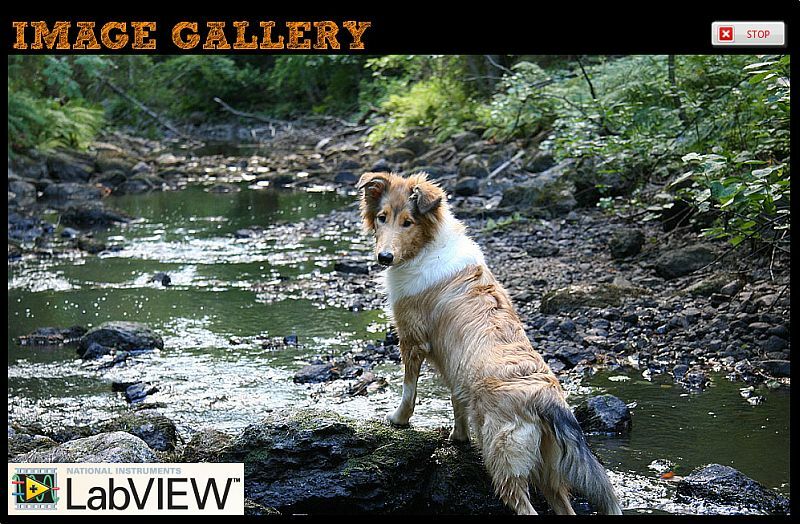 See the image below for my sample layout. Notice I have grouped elements such as text inputs, Boolean indicators, and buttons which I do not want to change size. In this example, the only element I want to scale as the UI resizes is the graph. Now it’s time to add one of the more underutilized elements on the front panel palette – splitters. These can be found under the “Containers” palette in both Modern and System sections. Adding a splitter to your VI will create a hierarchy of “Panes” on your front panel. Each pane can be considered a section of your front panel that can have separate resizing settings from the rest of the UI. There are horizontal and vertical splitters, and which you choose first is more important than you might think. It depends on your intended layout, but using my example it is obvious we want all of my text inputs to stay on the left as well I may want to leave some room below for future additions. As well, I want to keep my digital indicators in line with the left side of the graph. In order to keep the entire left side usable and clean, we should start with a vertical splitter. 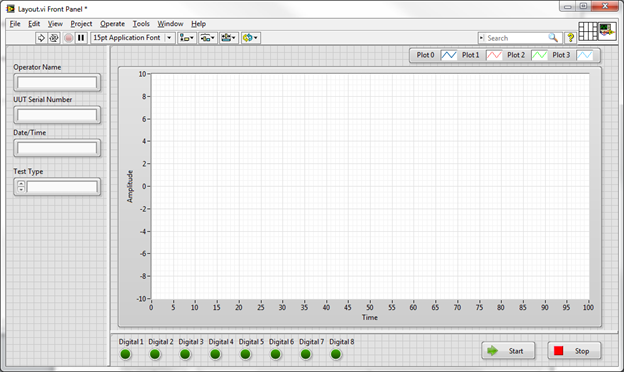 Drag a splitter onto the front panel and section off the left text boxes from the graph as shown below. At this point, it’s going to look a little sloppy with scroll bars everywhere. Simply right click on the splitter bar, drill down to the pane you are concerned with and turn off each scrollbar to clean things up. Looks better now, but the splitters are a bit thick by default. It’s a little tricky to do, but you can shrink down the splitters to be about 1 pixel wide and almost invisible by grabbing the resize terminals in the middle of the splitter when you hover the mouse over it. The next step that was not obvious before is relating to the buttons. We really would like the buttons to stay on the right side of the screen as it resizes, and keep the digital indicators on the left side of the screen in line with the graph. That will keep things looking clean as it resizes. How can we accomplish this? Add another splitter. Drop a vertical splitter just to the left of the buttons. Next we need to define which way each pane sticks, grows, and shrinks. This is all configurable from the right click menus on each splitter. By default, each pane will stick to the top left corner and will not resize when dragged. These default settings are good for our left pane, and our digital indicator pane. For the buttons, we want slightly different behaviour to keep the buttons on the right side of the screen. If you resize the screen now you’ll see the desired behaviour. 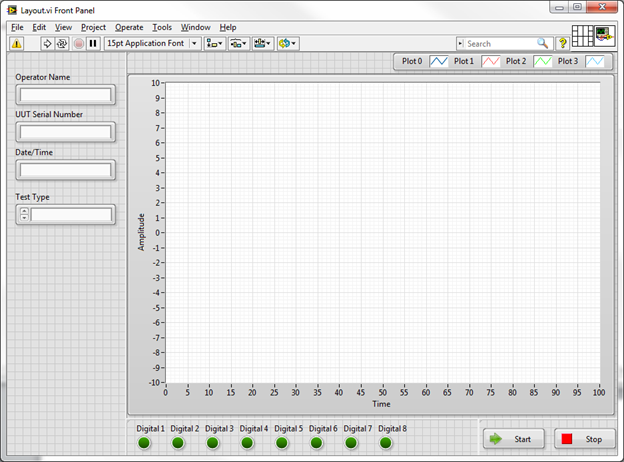 There is one last step, which allows the graph to resize. 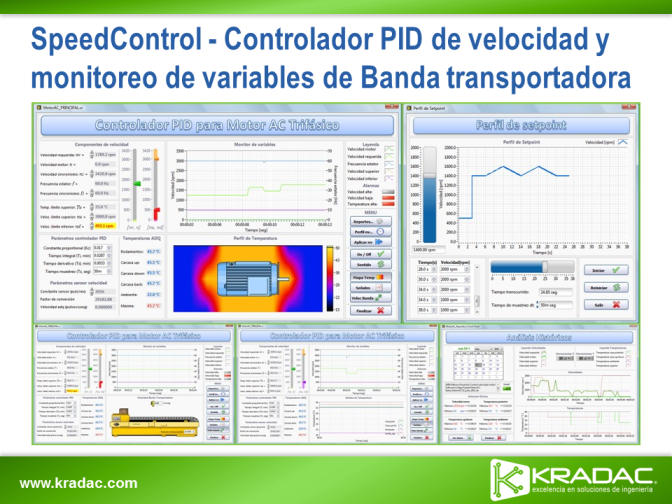 In order to do this, simply right click on the graph and select “Fit Control to Pane”. That’s it. Now resize the screen all you want, it will always lay out nicely. To add more controls and indicators with their own behaviour, just keep adding splitters as necessary. Once you have set up your UI, it’s generally a good idea to compress it down until it’s as small as possible while still being usable and set a minimum screen size. 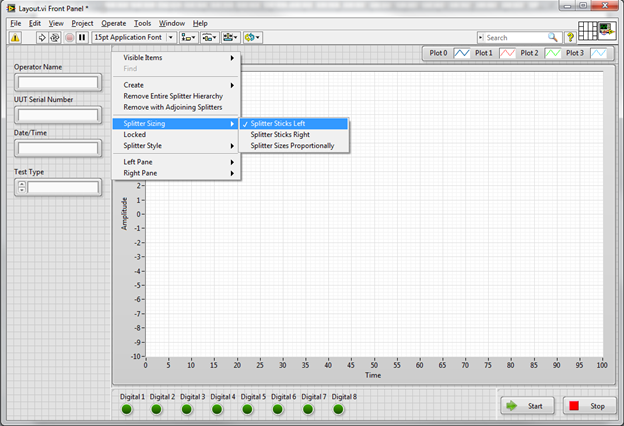 This will ensure users don’t make the window smaller than you ever intended (which can introduce some odd bugs in the LabVIEW layout). 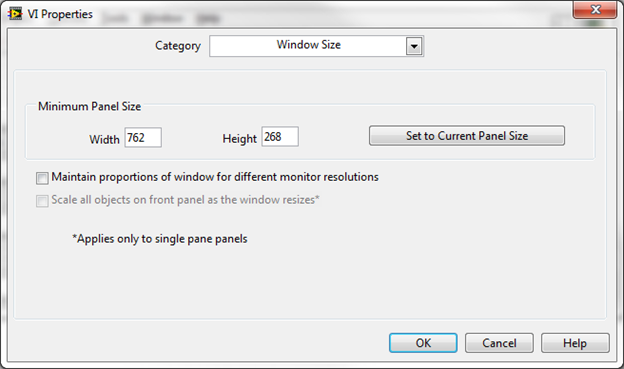 Go into VI Properties -> Window Size and click “Set to Current Panel Size” and click OK. 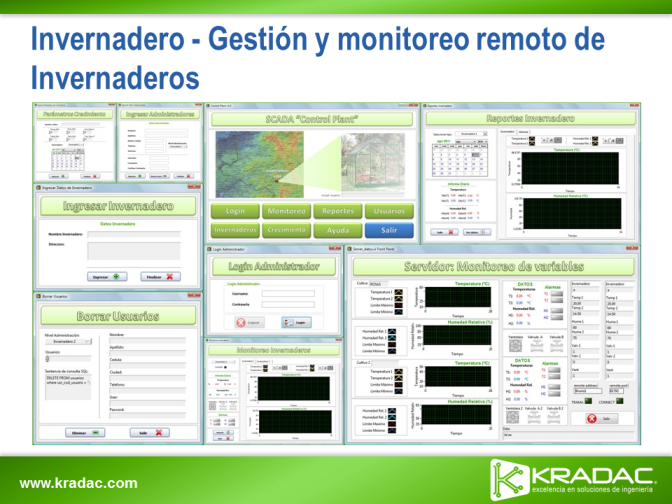 This was a simple demonstration for creating a simple, professional looking and scalable user interface. 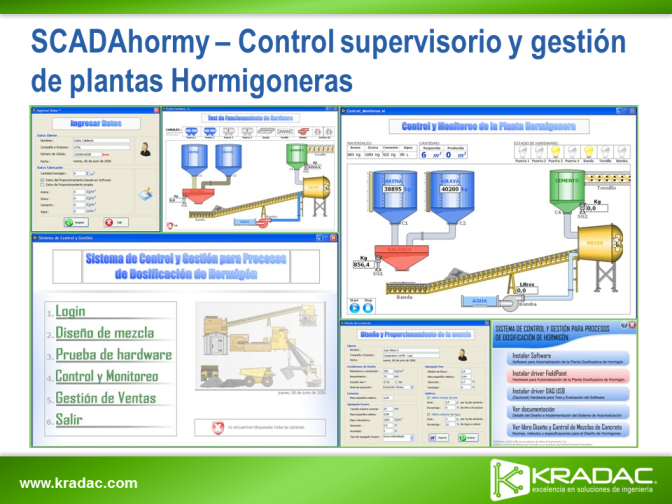 These concepts can be extended into much more complex interfaces involving tab controls, subpanels, XControls, etc. These more advanced topics are covered in my next blog: Advanced Resizable UIs: Multicolumn Listboxes. I created this tool for manipulating Front Panel objects (Controls/Indicators). If you work with UIs a lot then this tool is great for you! The main idea is that usually when you need to control UI object properties you will first put those references to for example cluster (because you cant use Array) and then reuse that cluster/references later on with your code. But that is not really good way to do it. Mainly because it is a mess and it always requires some work. Lots of references with different reference types etc. Lots of wires going all over etc. Just a cool cDAQ User Interface demo. 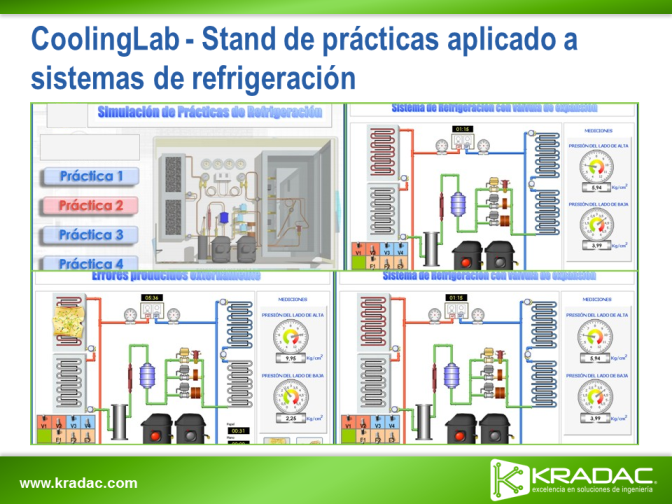 With this demo you can configure your measurements with cool UI. The configuration part can detect current system even if you add/remove modules during runtime. The UI will change according to current system. Which is pretty cool (specially with real HW). Also the measurement part has a cool UI (iPAD look and “touch screen like” scrolling effect). Why I made this demo? With LabVIEW it’s pretty easy to build something like this. 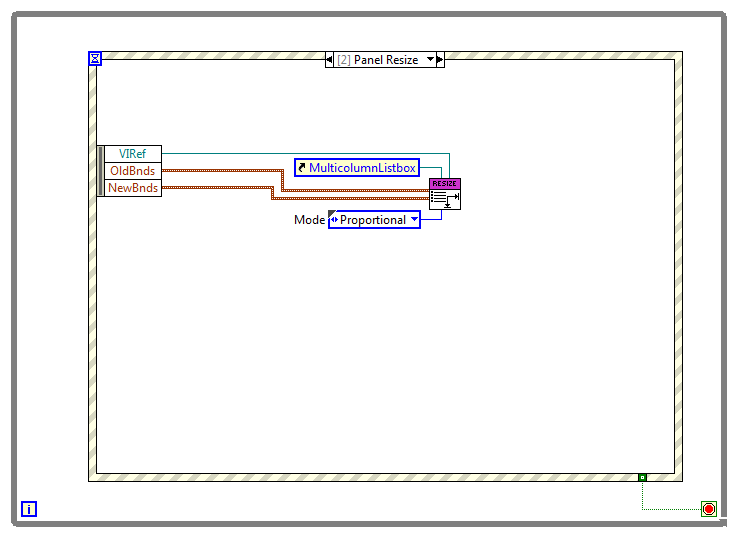 So this is just an example how to create cool UI with LabVIEW. There are multiple ways to demo this SW but I like to do it this way. Put the module back and hit the “Start Again” button and the code should continue measurements. Can I use it with Real HW too? Module types: NI 9211, NI 9215, NI 9219, NI 9234, NI 9263 and NI 9472. I was answering an email from one of our systems engineers this week and dug up this old demo to show him how you could quite easily implement sliding panels in LabVIEW. While I've shown a similar technique before I realized I've never shared this particular demo. 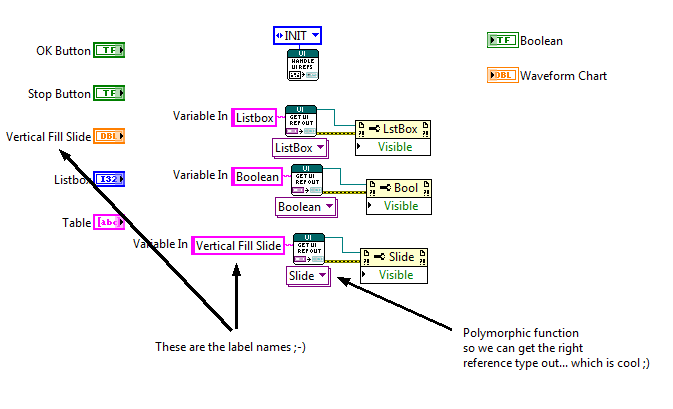 You can download the attached to code to see how I did it (LabVIEW 8.6 source IIRC). I haven't documented the code much and it's been a while since I last looked at it so please excuse any less-than-perfect coding style you see in there. If you have any questions, leave them in the comments and I'll try and answer them. My current project is to design a Labview UI on the LabView host computer and interface using ethernet to control some simple power distribution boxes to cycle the power to computers. 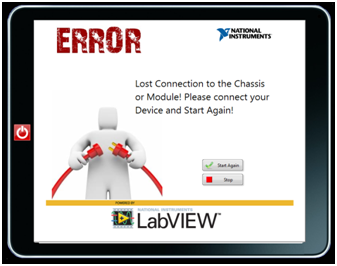 And use the LabView (Host computer) to capture the boot information like errors that is coming back on many serial ports from those computers. 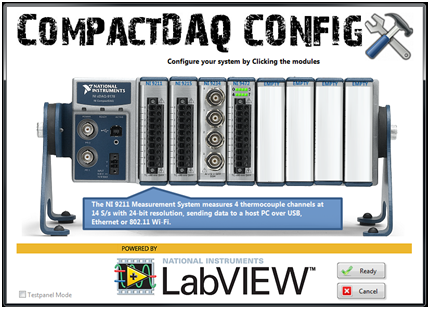 Labview will control the number of user specified reboots for the computers being tested and also capture and log all boot data from multiple re-boots. 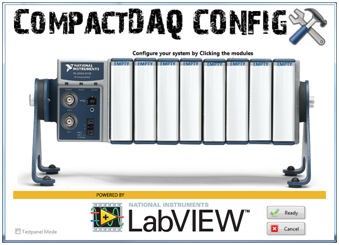 This is a very simply implementation of Labview and if I can acheive this with little cost impact then I will impliment Labview across our other more complex systems. Does anyone have an idea of what the setup and UI might look like? 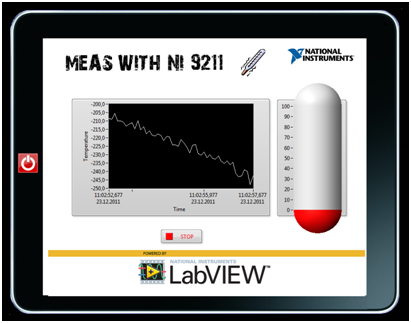 Here is a nice little custom control to make LabVIEW more like your iPhone. First of all, excuse me if someone else already done this, but I can't find a similar example. The attached example shows how to implement the "fluid-like" way of scrolling through a list of apps (i.e. 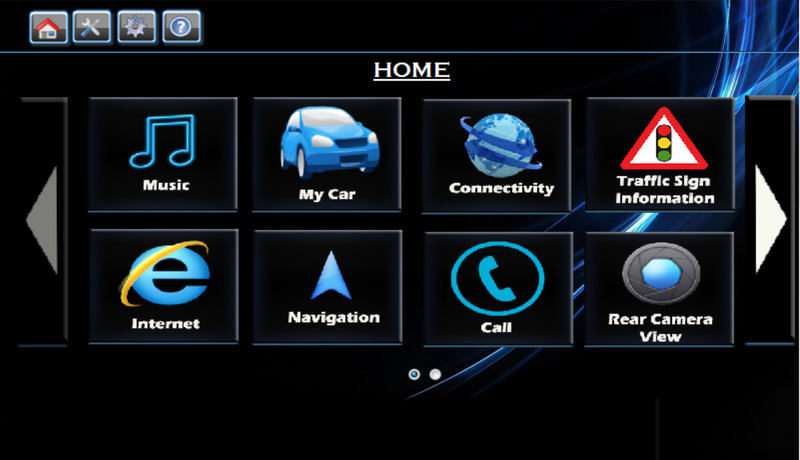 controls) just like you see in smart phones. You left-click the mouse to grab onto the list and when you move the mouse the list will follow. As you release the mouse the velocity is calculated and the scrolling attenuates gradually. I have used a cluster to group the controls to get a cleaner code, but I guess you could scroll the panel just as well, or a listbox or....whatever. The thing you need to do is to dynamically change the objects position. In this example I have only implemented a vertical scroll. 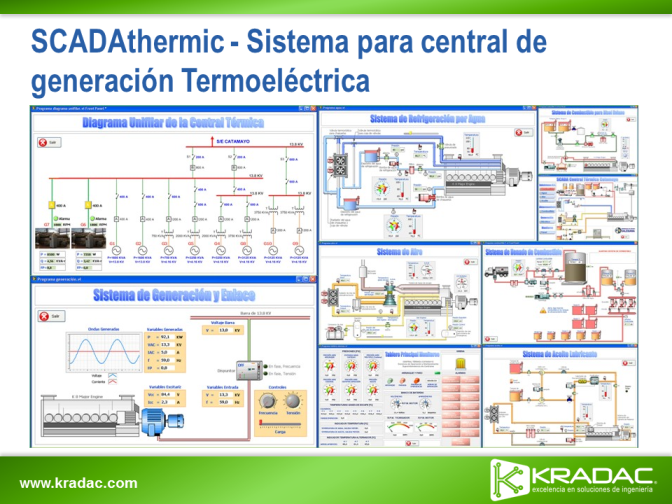 The code is developed without any subvis and without any elaborate design. I have only tried to quickly create an example for you to build from. So please try to optimize this before you implement it in a real program. The scrolling is eating lots of CPU, that's because mouse move events are triggered all the time. Probably a producer-consumer design pattern would be more efficient. 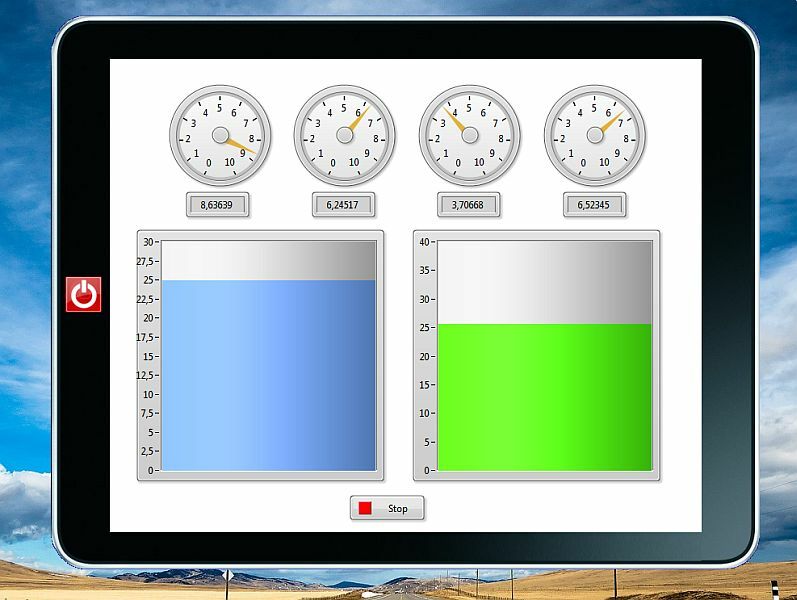 While this demo was obviously made using the in-development LabVIEW Web UI Builder the same visual effect can be created in your desktop LabVIEW applications today. 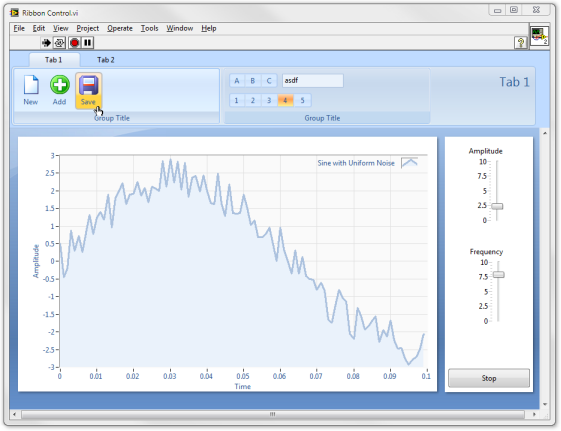 The attached VI shows the same UI implemented using some of my favourite techniques (namely recoloring graphs, panel backgrounds, using PowerPoint to create decorations, and using transparent images in a picture ring). The key to getting the rotating animation is to rotate the image in PowerPoint and save each rotation as a new image. Place each image in a picture ring and use the picture ring value to flip through the frames of your animation. The speed at which you update the value determines the speed of the animation. This is a very simplistic way of doing things and can bog down the CPU if you are updating the front panel too quickly (the human eye can only see ~10-20 frames per second, there is no need to update faster than that) -- a more advanced technique would involve only updating the image every 100 ms or so and calculating how which frame to skip to in order to simulate the "speed" of the rotation. 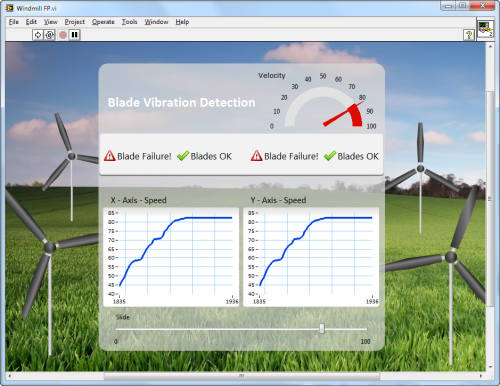 The Blade Failure!/Blades OK indicator is simply a button using the check mark and the warning icons as the true and false images respectively. The velocity "meter" at the top is really a gauge. I have edited the scale to only use 180 degrees of the dial and made the frame transparent. I then made the ramp visible and colored it accordingly. As always, I've attached the VI (LabVIEW 2010 format -- sorry, I have a small HDD and only keep the latest version installed) along with a zip file of all the source images (all images except for field.jpg were saved as images from the included .pptx file). I also saved the windmill as it's own .ctl file if you care to reuse it (I'm not sure how many people work with windmills so this may be of marginal benefit to most of you). Hope you enjoy this little tool, if you have the possibility to test/alter the VI for Windows 64-bit, Mac or Linux, please post your updates! EDIT: There was a small bug in the program that caused it to work for only one VI at a time, now it works for multiple VIs, you can set and reset at any moment you want, the tool should remember what the original icon should be. It is not advised to multiple times use a set and then use a reset. To use this tool you'll need to have the OpenG Application Control toolkit installed. 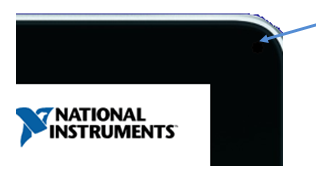 I had the chance to make a presentation for NIWeek and our Developer Education Days sessions this year and I decided to focus on highlighting some little known LabVIEW features and techniques that enable you to create very usable and attractive user interfaces. I've been using Windows 7 for a while now and I must say I like the improvements to the Taskbar. 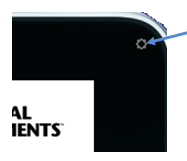 One feature that stood out to me, and which could be practical in a LabVIEW applications doing post processing for example, was the integrated progressbar in the Taskbar buttons. Seeing it's the last day be for Christmas I thought lest try and see if we can control this from LabVIEW. On the MSDN library I quickly found that there are two functions available on the ITaskbarList3 Interfaceto control the Progress bar behavior. Namely SetProgressState for controlling the State of the progressbar (Normal, Paused, Error, Indeterminate and NoProgress) and SetProgressValue for updating the progress. 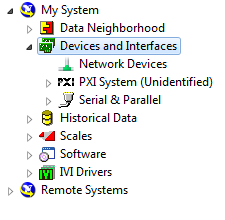 The only problem was that this is a static COM Interface implemented by Microsoft and I was unable to create this with the LabVIEW ActiveX interface API. If I can't access an arbitrary feature with LabVIEW I typically tend to try and see if it can trough .Net. Because .Net is much more defined it's much easier to use in LabVIEW then a Win32 DLL or ActiveX COM object. In this case the nice developers from Microsoft already made a Interop Libraries for the Windows 7 Taskbar. This is basically a big example that you can add to your own .Net Application to access the Features of the Windows 7 Taskbar without having to program all the interoperability your self. I just wanted to access the Progress Bar so I browsed trough the examples and build a Assembly that only exposes the two functions I needed (SetProgressState and SetProgressValue). Both functions require the Window Handle indorer to know which taskbar button needed to be updated. I already had VI that used the Win32 FindWindow function to retrieve the Window Handle of any Window based on it's exact Title. (This includes VI Front Panels ). I slightly altered this VI so it would return a IntPtr .Net Object instead of a the plain U32 so it can be used with the .Net InterOp functions. 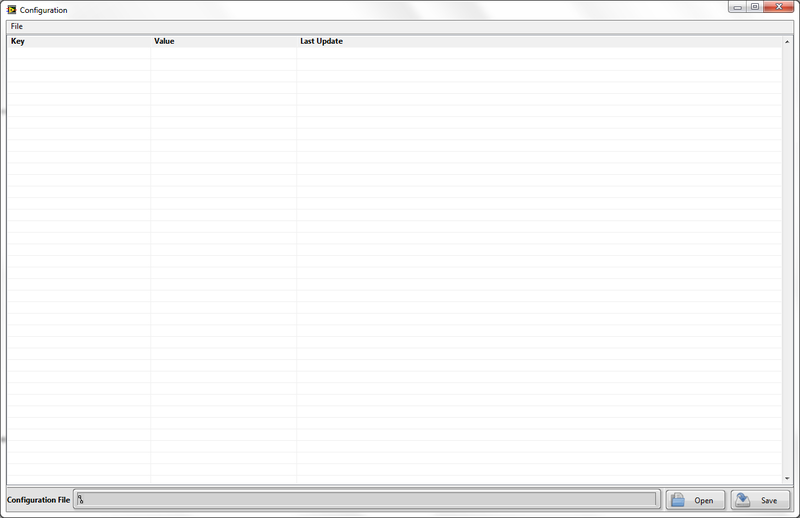 All that was left was wrapping the SetProgressState and SetProgressValue in a SubVI and the fun can begin. 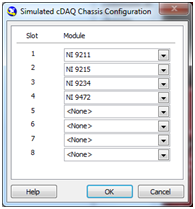 Attached you can find a simple LabVIEW 2009 API and Example that uses the .Net Assembly to call in to the Windows 7 Taskbar. I also Included the C# source code of the assembly for those who are interested. This release requires LabVIEW 2010 or later. 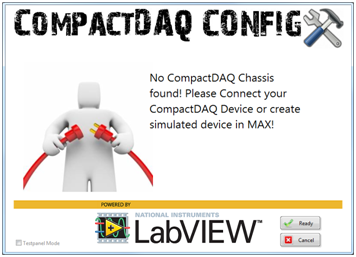 LabVIEW 2009 users can still use the original code attached to this blog post. You can make pop-up windows quickly and easily by using tab controls. By using tab controls, you can create the same visual effect and the same functionality as a pop-up window, but you don’t need to create a sub-VI. Since you never leave the VI, you don’t need to worry about passing information into and out of the dialog, simplifiying the code. While this technique may not be appropriate for every situation, it is a nice trick to have when you need a quick pop-up window.